This post originally appeared at Gradhacker.org on May 10th, 2013. One of the major aspects of academia is sharing your research throughpublic presentations. While public speaking can be stressful, it is a great opportunity to communicate your research and ideas to a wider audience and can be quite satisfying. No matter what kind of subject matter you are covering, there are a few simple hacks that you can use to improve you public speaking abilities. 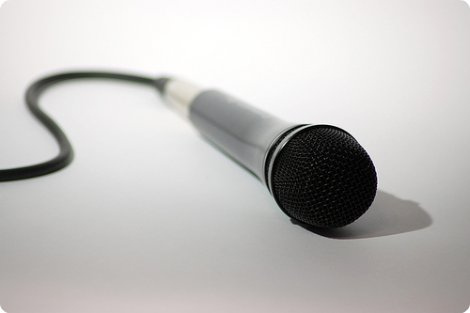 Project your voice: Even with common mic technology, it helps to speak in a clear, confident tone for presentations. In order to achieve this, it helps to slow your normal speaking pace and slightly lower your tone of voice. While different from your normal speaking voice, making these changes will help the audience follow what you are saying. If there is no speaker system it can be somewhat difficult to gauge how loud you need to be for a room. An easy way to determine if your voice is large enough for a room without a microphone is to have a friend sit near the back beforehand and have a conversation at a level where you can hear each other. Once you’ve gotten used to that tone and level, you’re ready to go. Breathe: Never underestimate the power of proper breathing in improving your speaking ability. When you breathe deeply, you don’t have to force your voice from your throat, which can lead to you sounding tense and higher-pitched. Another way to loosen up before speaking is to yawn, as this can help relax the throat as well. Learn your verbal tics: The most common is “um” and we’ve all seen this word take over presentations and become a distracting tic. During your next talk ask a friend or colleague to note any tics that you may be abusing so that you can minimize them in the future. Your audience will thank you! A note for the anxious: You are not alone! Public speaking isn’t a skill that appears over night, and repeated exposure is the best path to proficiency. Practice whenever you get the chance so that over time you can become desensitized to the stress of presenting. The communication of research and ideas through presentations is one of the cornerstones of academia, so the sooner you become comfortable with this skill the better it will serve you. Hopefully, after enough practice you can come to enjoy aspects of presenting and come to look forward to these opportunities. Do you have any other tips for improving public speaking skills? Share them in the comments section below!